Blissfield’s new doctor: Meet Cara Derck D.O. Posted on October 22nd, by Marcia Loader in News. 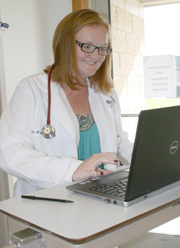 Comments Off on Blissfield’s new doctor: Meet Cara Derck D.O. Blissfield has a new face in family medicine with Dr. Cara Derck joining Dr. William Gray’s practice. Derck said she always wanted to practice medicine in a small community similar to the one she grew up with in Fostoria, Ohio. She said the tight-knit community of Blissfield returned her to her roots. “I always wanted to practice medicine in a small community with a country feel to it. Blissfield reminds me of home and so do the people,” she said. Copyright 2013, River Raisin Publications, Inc. For the complete story, please see the Oct. 23, 2013, edition of The Advance. To subscribe for weekly delivery – anywhere in the U.S. – please just call 517-486-2400.